I went hiking this morning at Catalina State Park and about 3/4 of the way through the hike the dogs and I came across a rattle snake. 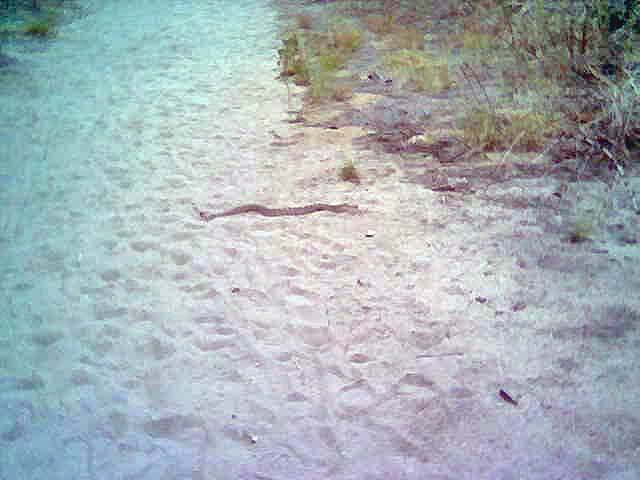 The dogs were on the retractable leash and they both stopped about 10 feet from the snake while it was crossing the trail. They watched it for a bit and as soon as it rattled it’s tail they both bolted about 15 feet behind me and away from the snake. It was incredible to see their reactions to it! I wanted to thank Penny for getting me to take the snake class, since I was being stubborn about it. During the snake class Natasha went right to the rattler and was struck by it. I imagine the same thing would have came true today on the hike if it hadn’t been for the snake training. I attached the images of the snake to this email for you guys to see. Just wanted to say ‘THANKS’ to both of you and that the class works extremely well!